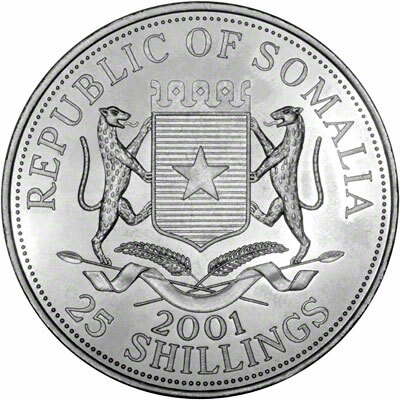 In 2001, Somalia issued a 25 shillings coin marking the centenary of the ending of the Victorian era. On the reverse of this crown sized coin is a superb reproduction of the gothic portrait of Queen Victoria as originally used on the gothic crown of 1847. 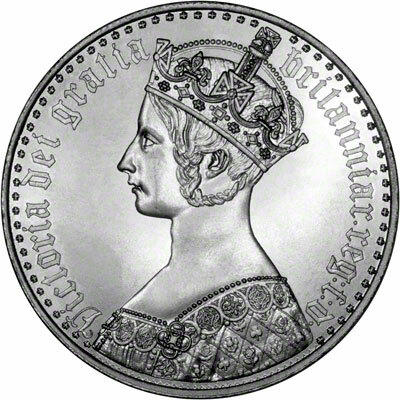 Of all the different portraits of Queen Victoria on the coins of her 65 year reign, we believe that the gothic head as used on the gothic crown of 1847 was the most beautiful. This crown is difficult to find in high grades of preservation, and therefore expensive. The same portrait was also used on the gothic florins issued from 1852 to 1887, but of course these are smaller and therefore not as spectacular as the crown; even so they are quite expensive is top condition. Because of this, we believe this Somali crown makes an interesting and inexpensive addition to a portrait collection of British coins. Face Value = Denomination in Australian Dollars. Weight = Standard weight in grams. All prices on our websites are subject to fluctuation and availability. Please check before ordering.